The BMW E36 is the third generation of the BMW 3 Series range of compact executive cars, and was produced from October 1990 to 2000. The initial models were of the four-door sedan body style, followed by the coupe, convertible, wagon ("Touring") and hatchback ("Compact") body styles in later years. The E36 was the first 3 Series to be offered in a hatchback body style. It was also the first 3 Series to be available with a six-speed manual transmission (in the 1996 M3), a five-speed automatic transmission and a four-cylinder diesel engine. The multi-link rear suspension was also a significant upgrade compared with previous generations of 3 Series. The E36 was named in Car and Driver magazine's 10Best list for every year it was on sale. The E36 M3 is powered by the BMW S50 or BMW S52 straight-six engine (depending on country). The E36 M3 was released in 1992 and was available in coupé, sedan and convertible body styles. Following the introduction of its successor, the E46 3 Series in 1998, the E36 began to be phased out. Development of the E36 began in 1981 and the exterior design was heavily influenced by aerodynamics, specifically the overall wedge shape, headlight covers and smaller wing mirrors. The lead designers were Pinky Lai and Boyke Boyer. The E36 production was launched in October 1990, with press release in November and market launch in early 1991. 4-door sedan/saloon, sold from 1991 to 1998. 2-door coupé, sold from January 1992 to 1999. 2-door convertible, sold from 1993 to 1999. A Baur "Top Cabriolet" conversion was also available. 5-door wagon/estate (marketed as "Touring"), sold from 1994 to 1999. 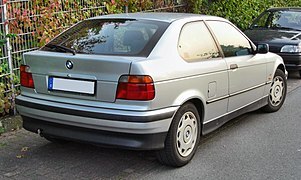 3-door hatchback (see BMW 3 Series Compact), sold from 1993 to 2000. Safety equipment available included a driver's airbag, passenger airbag, ABS braking and stability control ("ASC +T"). Electronic climate control was also available on the E36. The four-cylinder petrol engines used in the E36 range were initially engines carried over from the previous generation 3 Series: the BMW M40 SOHC engine and the BMW M42 DOHC engine. In 1993, the M40 was replaced by the BMW M43 SOHC engine and the M42 was replaced in 1996 by the BMW M44 DOHC engine. For the six-cylinder models, the E36 was launched with the then-new BMW M50 DOHC petrol engines. In 1993 the M50TU versions added single-VANOS (variable valve timing), which increased torque (peak power was unchanged). In 1995, the BMW M52 engine replaced the M50TU, resulting in the 328i model replacing the 325i and the addition of a new mid-range 323i model (powered by a 2.5 litre version of the M52). The 1992 M3 introduced the 3.0 L BMW S50 engine. In 1995, its capacity was increased to 3.2 L and VANOS was added to the intake camshaft. Initially, the turbocharged straight-six BMW M51 engine was used in the E36 325td model. In 1993, the 325tds model was released, which added an intercooler to the M51. In 1994, the 318tds model was introduced, powered by the four-cylinder BMW M41 turbocharged and intercooled engine. All models are rear-wheel drive, since the E36 was not produced with all-wheel drive (unlike its predecessor and successor). The sedan, coupé, convertible and Touring models use the "Z-axle" multilink suspension in the rear, which was introduced in the BMW Z1 roadster. The hatchback ("Compact") models use a rear semi-trailing arm suspension based on the older E30 3 Series design. This was done in order to save space due to the truncated rear end of the hatchback. The E36 M3 is powered by the BMW S50 and BMW S52 straight-six engines, and was produced in coupé, sedan and convertible body styles. The Alpina "B6 2.8", "B3 3.0", "B3 3.2", "B8 4.0" and "B8 4.6" models were based on the E36. The B3 and B6 models were powered by straight-six engines, while the B8 models were powered by V8 engines. The 3 Series Compact range of three-door hatchback models were introduced in 1993, based on a shortened version of the E36 platform. The model code for the hatchback body style is "E36/5" and the model range consisted of the 316i, 318ti, 323ti and 318tds. A modified version of the E36 platform was used for the 1996-2002 Z3 roadster (model code E36/7) and coupé (model code E36/8). The BMW E36 3 Series was imported as a Complete knock-down car. Between 1995 and 1999, the Thai market lineup included an exclusive 2.4L version of the M52 engine with 135 kW (181 bhp). 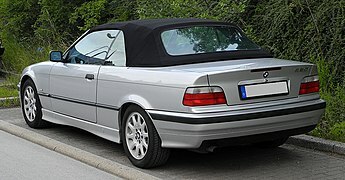 323i (1996–1998) Coupe and convertible models only. 325i, 325is, 325ic (1993–1995) Coupe models sold as 325is. 328is, 328ic (1996–1999) Coupe models sold as 328is. Diesel models were not sold in the United States. A sport version of the 318i in coupé form which was powered by the BMW M42 DOHC engine. The 318is had an Mtech bumper, skirt, 16-inch alloy wheels, a rear spoiler, and a sportier interior. In 1993-1994 BMW North America produced 150 "325is Mtechnic" models. Bodyworks included the M3 front spoiler, side skirts, rear valence and rear-vision mirrors, and all were painted with BMW Alpine White III. The result was a model with the appearance of a 1995 M3, however without the higher performance engine. Handling upgrades included 17-inch BBS alloy wheels, M Tech suspension and a limited slip differential. Joachim Winkelhock competed in the British Touring Car Championship with the 318i and 320i from 1993 to 1995, winning the title in 1993. In the same year, Johnny Cecotto won the German ADAC GT Cup driving an E36 M3. Cecotto won the Super Tourenwagen Cup for BMW in 1994 and 1998, Winkelhock in 1998. Geoff Brabham and his younger brother David Brabham won the 1997 AMP Bathurst 1000 at the Mount Panorama Circuit in Bathurst, Australia driving a Super Touring BMW 320i for BMW Motorsport Australia. The 1998 24 Hours Nürburgring was won by a diesel for the first time - a BMW E36 320d, aided by its diesel engine requiring fewer fuel stops than rivals. ^ Jacobs, A. J. (2015). The New Domestic Automakers in the United States and Canada: History, Impacts, and Prospects. Lexington Books. p. 259. ISBN 9780739188262. Retrieved 24 December 2017. ^ a b c d "The BMW 3 Series Coupés" (PDF). BMW. 1996. Retrieved 19 February 2019. ^ "1998 10Best Cars - 10Best Cars". Retrieved 6 January 2017. ^ "3 Series - E36 (1990 - 1999)". www.bmwheaven.com. Retrieved 21 December 2017. ^ "BMW 3 Series history. The third generation (E36)". www.youtube.com. Retrieved 21 December 2017. ^ "Interview with automotive designer Pinky Lai". www.designboom.com. Retrieved 3 January 2017. ^ "BMW car designers throughout history". www.bmwism.com. Retrieved 3 January 2017. ^ Caspers, Markus (2017). Designing Motion: Automotive Designers 1890 to 1990. Birkhäuser. p. 79. ISBN 9783035607840. Retrieved 18 June 2018. ^ "1975 The history of the BMW 3 Series". www.topspeed.com. ^ "BMW 3er E36 (1990-2000)". www.motor-talk.de (in German). Archived from the original on 26 October 2012. ^ Taylor, James (2001). Original BMW M-Series. ISBN 9780760308981. ^ "3'E36 Compact 318i model selection". www.realoem.com. Retrieved 1 April 2017. ^ "Used BMW 318i review: 1991-1998". www.carsguide.com.au. Retrieved 7 April 2019. ^ "FAQ E36 M3 3.0". www.bmwmregistry.com. Retrieved 7 April 2019. ^ Cobb, James G. (12 July 1998). "BEHIND THE WHEEL/BMW 323is; Last Hurrahs for a Star Performer". The New York Times. ISSN 0362-4331. Retrieved 31 October 2016. ^ "3-series [E36]". www.alpina-archive.com. Retrieved 7 April 2019. ^ "BMW 3 Series E36". www.alpina-automobiles.com. Retrieved 7 April 2019. 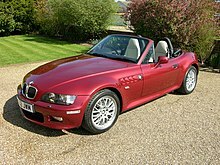 ^ "RealOEM.com - Select Your BMW Model". www.realoem.com. Retrieved 16 January 2017. ^ "1994 BMW M-Design 325is Coupe". www.hemmings.com. ^ "1994 M-Technic 325is". www.home.comcast.net. Archived from the original on 16 February 2015. ^ "BMW World - Nürburgring 24 Hours". www.usautoparts.net. Archived from the original on 11 April 2011. ^ "BMW motorsport press release". www.bmwsport.net. Archived from the original on 23 July 2011. Wikimedia Commons has media related to BMW E36.